Frank Dimuth Madushanka Karunaratne is a Sri Lankan batsman who is a solid opener for Sri Lanka. In the post Sangakkara and Jayawardene era, he has emerged as the new batting leader of the Sri Lankan team. 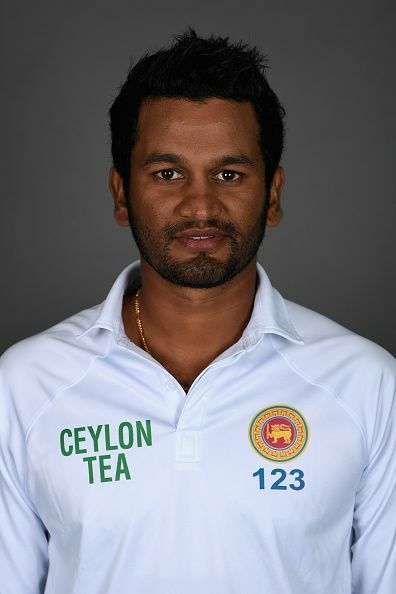 Dimuth Karunaratne was born on 21 April 1988 in Colombo, Sri Lanka. He is a left-handed batsman and a right-arm medium pace bowler. He is known to play long and gritty innings as he has shown in test cricket. Karunaratne started his journey from school cricket. He studied at St. Joseph's College which has produced many Sri Lankan cricketers including Chaminda Vaas and Angelo Mathews. Karunaratne, while playing for St. Joseph broke a college record which had stood tall since 1934 by scoring 131 in a college match. He continued showing his batting prowess and worked his way up to the Sri Lanka Under-19 side. He made his first-class debut for the Sinhalese Sports Club in 2008 but could not impress much. A change in the batting position in 2009 resulted in him hitting 1186 runs in the season at an average of 56.54. The impressive performance saw him being included into the Sri Lanka A squad to play against South Africa A at home. He put on a show and scored 184 runs in the innings. On the back of strong domestic season and good performances in the A side, Karunaratne was included in the ODI team for the series against England and Scotland. He made his debut against England at Manchester in July 2011. He opened the batting and could score only 4 runs. In his next match against Scotland at Edinburgh, he scored 60 runs off 82 balls. He made his Test debut against New Zealand at Galle in November 2012 and got out on a duck in the first innings. However, he scored an unbeaten 60 to take the team home. Karunaratne rose to prominence as selectors really took a note of him when he scored a brilliant 184 against South Africa A. He scored his maiden test century in December 2014 against New Zealand at Christchurch, hitting 152 runs off 363 balls. A few months later, he scored a brilliant 186 off 354 balls against West Indies at Galle. Sri Lanka won the match by an innings and 6 runs. He had a stellar 2017 where he scored 1031 runs in 13 matches at 39.65 including his career best 196 against Pakistan at Dubai. He became the 7th Sri Lankan batsman to score 1000 runs in a calendar year. Karunaratne has been around for quite some time now and is racking up runs quickly. He has amassed 3151 runs in 47 test matches at 35.40 including seven hundred and 14 fifties. In 17 ODIs, he has scored 190 runs at 15.83 including one fifty. He is only the third opener in Sri Lanka's history to score more than 3000 runs in test cricket.